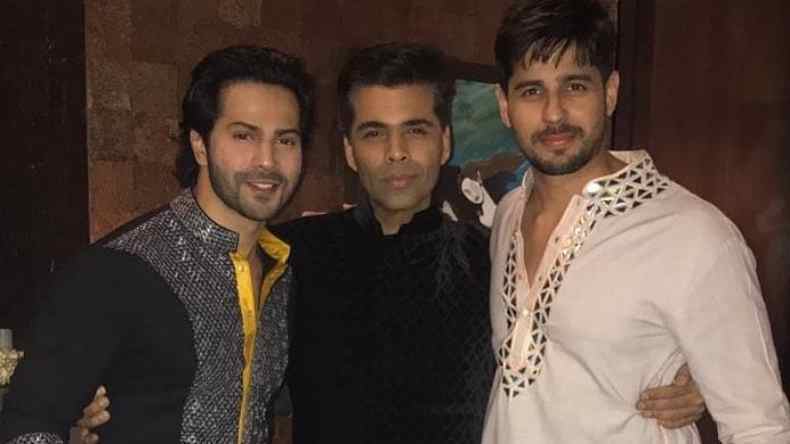 Student Of The Year reunion: Karan Johar poses with Varun Dhawan and Sidharth Malhotra in his Diwali party! Out of all the Bollywood parties, Karan Johar throws one of the most happening ones. Same happened this Diwali too, the director-producer hosted a grand Diwali bash in which many Bollywood stars were invited. Gathering so many Bollywood celebrities made it a star-studded affair for sure. The inside photos and glimpses of the party are surfacing on the internet since the day of the festival. The stars came in the best of their ethnic outfits and swayed fans with their looks in the party photos. Stars like Kareena Kapoor Khan with Saif Ali Khan, Varun Dhawan with girlfriend Natasha Dalal, Sidharth Malhotra, Alia Bhatt, Sara Ali Khan, Arjun Kapoor and Malaika Arora were all present in the party and made it a memorable night. Of all the photos that are making rounds on the internet, we have brought this nostalgic still for you. In his grand Diwali party, Karan Johar posed with his students Varun and Sidharth and this photo will instantly remind you of their super hit debut movie Student Of The Year. The film not only gave them a hit debut in the industry but their strong bond with Karan Johar also helps them be selective in Industry. Both the hotties have now established a good career in Bollywood and enjoy a huge stardom. Karan Johar took to his official Instagram account to post this photo and captioned it with the warmest title Student for Life. Three of them are looking dashing in the photo. Karan Johar can be seen wearing a black velvet kurta while Varun is sporting a black short kurta with silver embroidery. Sidharth is adding the contrast to the image with his white kurta.